This is an overview of the different functions in the Messages section of your account, as well as the Save/Send a Test/Send functions in the message composition screen. If you're a new customer just getting started, check out our Quick Start Guide. This is the starting point for all users. From here, you can choose to use a New Blank Message to create your campaign from scratch with JangoMail's WYSIWYG editor or paste in your own HTML. You may also choose to use a JangoMail Smart Template with our Template Tool. Additional features are available if you choose to use them. Once you have created a message, you can mark it as a template of your own and then select "using My Templates" from the New Message screen. You can also upload your own HTML template utilizing the FTP method, and choose it from the Uploaded Template section. Starting from scratch isn't your only option once you've created at least one message. With the Copy icon on the Messages screen, you can create a message exactly like the original or pick and choose what parts to copy into a new message. You can choose to leave all selected or click to deselect a certain part of the message. For instance, if you've created a newsletter but want to send one with attachments to your customers and another without attachments to your internal team, you can send your message normally with attachments. 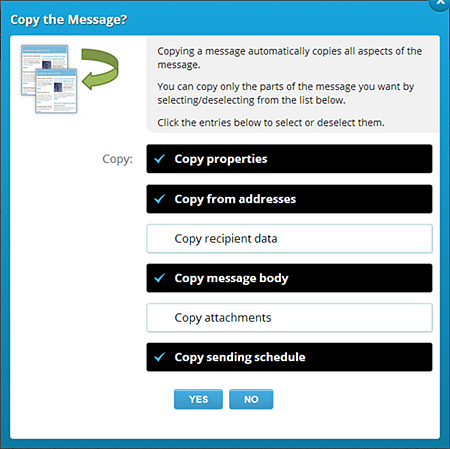 Then to send to your internal team, without attachments, click Copy and deselect recipient data and attachments. After you click Yes, the next screen will have an identical copy of your message but without the recipient data or attachments. With the Copy feature, you can save time and maximize your efforts! Edit mode serves two purposes, one for automated messages and one for non-automated messages. Triggers, Autoresponders, and Recurring Messages are all automated messages. Scheduled messages fall into this category as well. To create these, you would follow the steps of creating a new message and then first you must compose an email and save it. You can do this by saving it or sending it to yourself. A message automatically saves when you send it.. The setup for these messages can be found in other tutorials. Once these have been set up, you can click the Edit icon to make changes for the next time the automated message is sent out. When you edit, there will not be an option to send (i.e. no Send button appears) because it occurs in an automated schedule. To use an automated message as a mass campaign, simply use the Copy icon on the Messages screen. Non-automated messages are all messages except Triggers, Autoresponders, and Recurring Messages. These are mass campaigns, previews, and all others. After you have created a message and saved it in the system by saving it or sending it, you can enter via the Edit icon to make changes to the content and settings of the campaign. If you mark a campaign as My Template to use for future messages, you can edit and click Save to retain your changes. If you want to send immediately with your new changes, you can choose the Send button. Clicking Send from within Edit mode will create a new campaign with a new ID. It will not overwrite the original campaign/message with your changes. To overwrite the original message with your edited one, click Save before sending. Save early, save often! As you work on your messages, make sure to click the Save button to keep track of your changes. If you create a new message, there is no campaign ID assigned to it until you click the Save or Send buttons. Saving does not interrupt your work but allows you to make sure your message is kept up to date! Whether it's minutes or days after hitting Save, you can easily click the Send button once you're ready to launch your campaign. It's important to always test your messages before you send. Doing so allows you to fix incomplete links or correct any styling issues, along with anything else that needs to be changed before your recipients see the final product. 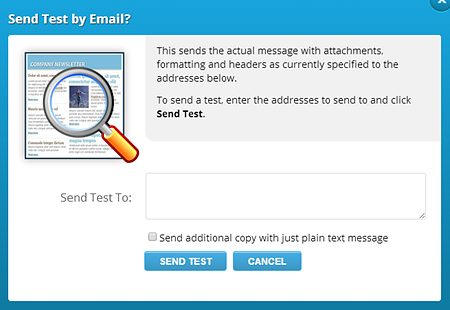 Easily send yourself or your team a preview by clicking the Send a Test button. In the popup, specify the address or the test list that should receive the preview. Note: If you're using personalization, it will not appear if only an email address is specified. Designate a list as a Test List in the Settings area inside of a specific list to test personalization with the Send a Test popup or simply attach a list and click the Send button. This is the ultimate goal. Once you have created, copied, edited, saved, or tested, you're ready to hit Send. If you are starting with a new message that is without a campaign ID, clicking Send will assign an ID to the message and send the message. If you are editing a previously sent or saved message, clicking Send will not alter the original but will create a new message with a new campaign ID and send the email. Haven't tried some of these features? Read about them now! Hit the ground running with the Quick Start Guide. Explore the different styles and formats of JangoMail templates. Personalization will set you apart from the rest of the competition!